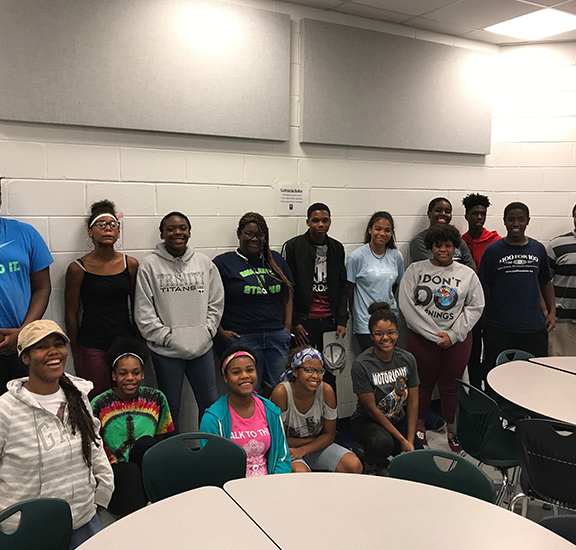 UP RVA connects students from limited economic resources in the City of Richmond and independent schools. Knowing attendance is only the first step, UP RVA provides services that advocate, support and empower students to become successful members of their school community. We believe every student has unlimited potential. And, with the right support, students can build the educational, social, emotional and life skills needed to reach their goals for high school, college and long-term success. Every UP RVA student has an action plan to ensure success in high school and beyond. Our staff and community partners work together to provide a wide-range of unparalleled services to help students reach their potential. These include activities and support both in and out of school, in an effort to ensure not just educational success but success in life as well. Our tutors work with students to provide additional educational support in core classes and electives. Our goal is success in high school and beyond. We partner with students, families and the school to ensure a positive experience. Students also receive help with SAT prep, college visits and job placement. Unique to UP RVA, this three-week immersive experience allows new students to acclimate to the independent school environment during the summer prior to their freshman year. Located at Anna Julia Cooper Episcopal School, our after-school program serves our students and the broader community by providing nightly access to wi-fi, a hot meal, and tutors. Our counselors provide the social and emotional support students need as they transition to independent schools. The UP RVA lawn service provides students a source of income while teaching life skills. From 6:00 am to 10:00 pm our drivers are on the road, ensuring students arrive at school, practice, after-school and social events. Get involved in helping students reach their unlimited potential. Our students attend a wide range of independent schools across the City of Richmond and surrounding areas.